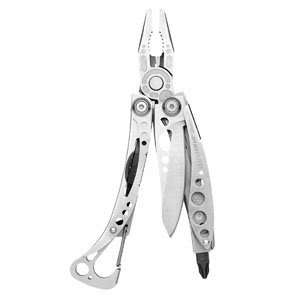 The Skeletool is a streamlined fullsized multitool offering the most basic tools at a reduced price and weight. The tool includes pliers with needle noose ends and wire cutters, a blade, a driver that can use exchangeable bits, a carabiner and bottle opener a bit storage compartment and a removable pocket clip, nothing else. There are two versions of the skeletool, the regular one in aluminum with a plain blade and the CX version with tungsten cover and a partially serrate blade. The pliers are strong and good as it is common in leatherman tools, the handles are ergonomic but if you need to do a lot of pressure the grip might be a little unconfortable. The blade is made of 420HC steel and is plain in the aluminum version and partially serrated in the CX version, it cuts really well and locks in place when deployed. The driver is compatible with the charger bits, included are two philips and two flat screwdriver bits, you can store one bit in the driver and an extra one in the tool handle so you can carry your two most used bits in the tool, it works really well and has a good torque. The carabiner doubles as a bottle opener, it is probably not the best carabiner nor the best bottle opener found in a multitool, the tension of the spring is slightly annoying when opening bottles and when clipped the tool just moves a lot, the way the tool is clipped is a little strange so its not easy to find a way to carry it using the carabiner. The pocket clip that is removable works very well and being the tool small is quite good for pocket carry. At only 5 ounces (142 grams) the Skeletool is a reduced version of the Charger with many of the tools left behind but if you need a light tool and the options this tool provides are good for you then you can find a serviceable light option in the Skeletool. You can get it for $60 from Amazon.